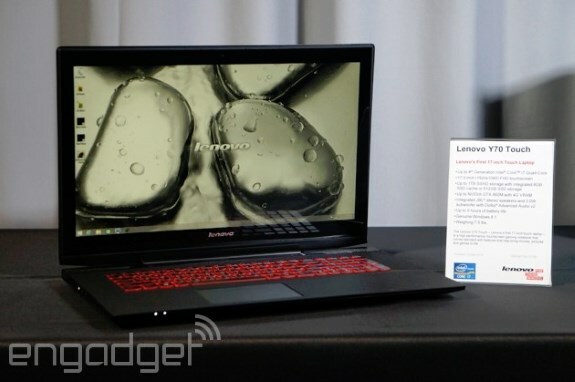 Lenovo is about to introduce the Y70 Touch, a new 17" gaming laptop that is surprisingly thin and light for its size. Engadget writes the mobile gaming notebook weighs 7.5 pounds (3.4kg) and has a brushed-metal chassis and a keyboard with a red backlight. The Y70 Touch features Intel Core i7 "Haswell" quad-core processors with NVIDIA GeForce GTX graphics options up to the 860M 4GB as the highest-end option. Other than that, you can get up to 16GB DDR3 memory and a 256GB SSD or 1TB hybrid HDD with 8GB flash. You also get JBL speakers with a subwoofer tucked on the bottom of this notebook. One slightly less impressive element is the maximum resolution of the display is only 1920 x 1080 pixels. The battery life is rated at five hours and the base price when the Y70 Touch becomes available in October will be $1,299.